At the North American Iroquois Indians were along with pumpkin, corn and bean grown. They are called the three sisters. As plants and as food they complement each other very well. There are combinations that go well or less well. The latter does not mean that none of the crops would grow. You can try it out for yourselves. 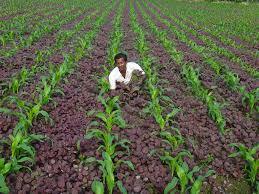 When interplanting different crops are cultivated after (pre -, main and progeny) and next to each other. So consider various times to (sow and) harvest. Plants that have a positive influence on each other (growth, maturation, protection) are grown together. And bad neighbors are obviously avoided. That influence can include confusion by shape, smell,.. thus destroying insects are deceived. Monoculture is a ‘land of plenty’ for attackers who flock there to find food and exuberant grow. In a variety of mixed culture that is (more) limited. That biodiversity of the garden also attracts more different species. So there are more natural enemies that keep the attackers in check. The probability of a massive surprise attack by a pest is smaller. For example, nasturtium and marigold attract black bean aphid. As a capture plant they will indemnify your other vegetables. All plants give specific root acids, so they release nutrients. The vegetables that are adjacent, may benefit as well. Some plants affect by root exudates also the soil. Thus reduces Tagetes patula (marigold) ​​the nematode population by root exudates. At least if you sow the whole lot with it - otherwise not. Nematodes are tiny round worms (0.5 mm) which also affect plants, each specializing in their own kind of task or host. Marigolds are known in organic farming as fragrance confusion and soil fumigation. Also, marigold and nasturtium is used as soil disinfectant along with crop rotation. Tall plants take light away from lower plants. They may also provide shelter from heat or support climbing plants. Make sure leaves and stems above ground not discomfort each other. Roots grow through each other. They can even compete with each other in the uptake of water and nutrients. You will find many tables of good and bad combinations. Sometimes the data are contradictory. There is little scientific evidence. It is also difficult because there are too many variables. Races, distances, sowing dates, fertilizer, soil, water resources and other conditions differ greatly from garden (er) to garden (er). The most common combination is probably onion and carrot, which each keep away predators. The carrot fly (Chamaepsila rosae )cannot fly high, so growing carrots in pots on a table is a good option. Or 1 meter high insect netting around the carrots, which also makes them virtually inaccessible. Or sow next to each row of carrots a row onions, carrot fly cannot stand the smell of onion. The table below gives you an idea of ​​the possibilities. Birch or elderberry combines well with a compost heap, not pine. Many insects are now also evolved greatly through the use of monocultures with pesticides causing many old remedies / combinations barely works.